This week we look back at an interview with author and game enthusiast Brett Weiss. This interview was done on November 29th, 2015. Today we look back at an interview I did from January 26th, 2016. I talked with Galloping Ghost Owner Doc Mack. With now the largest arcade in the world with over 630 arcade games to date, Galloping ghost arcade is a place you need to visit and experience for yourslef. 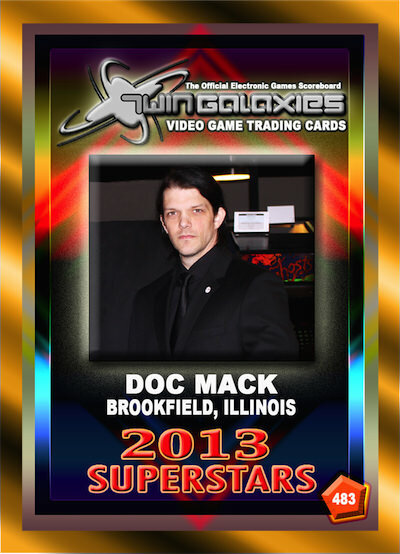 Our next Trading Card Spotlight features Doc Mack who currently is displayed on card number 483, from the Superstars of 2013 Collection. Doc is the owner of an arcade in Brookfield, IL called The Galloping Ghost Arcade. This is not your ordinary arcade of today; Doc has around 500 arcade machines up and running for all to play. It is the biggest arcade to date in the United States. You can play old classics such as Galaga and Pac-Man or play some games of today such as The Grid, or Mortal Kombat X. Doc is also the owner of Galloping Ghosts Productions which is currently working on the arcade game Dark Presence. His company designs and builds arcade games for other arcades in his area. Doc is a huge supporter of local and out of state video game events brining his personal machines for people to enjoy and try to break records on. Our next Trading Card Spotlight features Dennis Blechner, who is displayed on card number 991, from the Superstars of 2014 Collection. Dennis is an avid gamer who loves playing such games as Tetris and Bubble Bobble. 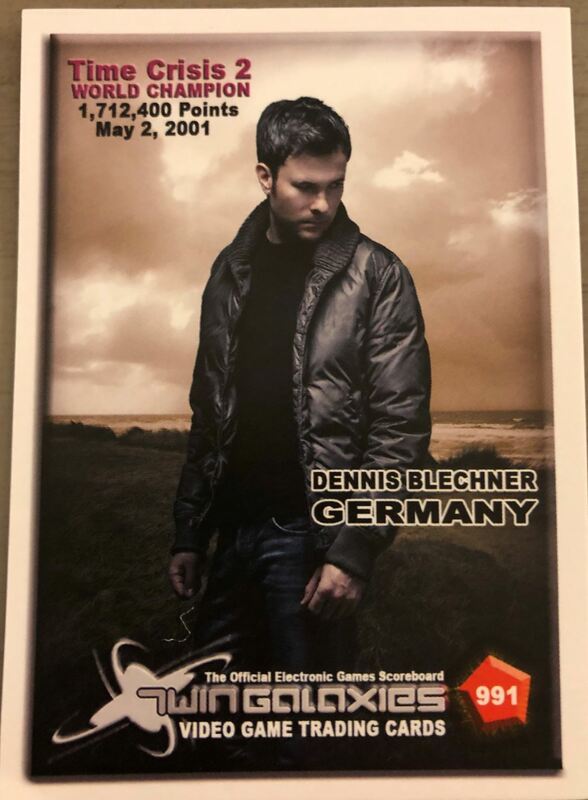 Dennis holds many records in the gaming industry in multiple genres. He is a record holder on Grand Turismo 1 on the PlayStation 1, In Europe, Dennis captured the title on four different tracks. He also holds the singles and doubles record on Time Crisis 2. He currently is trying to break some records on the PlayStation 4 on the game Trials Fusion. Since the last 2 years I spend much time in playing Trials Fusion on the PS4 to get every track in platin and reach the Top 500. I liked this type of games. I often play also older games like Bubble Bobble or Streets of Rage. I really like at most games which are like arcade games to reach high scores. 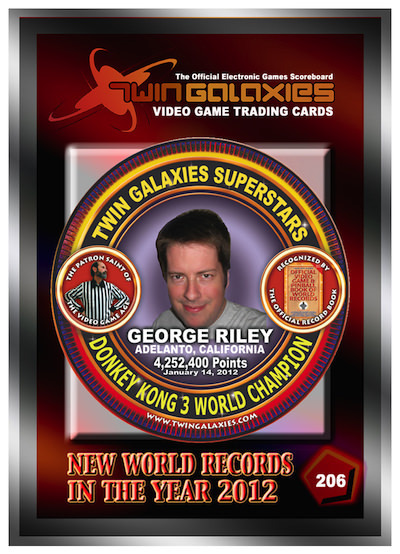 Our next Trading Card Spotlight features George Riley, who is displayed on card number 206, from the Superstars of 2012 Collection. He is also featured on card number 369. George is a widely know Donkey Kong 3 Champion. His scores on M.A.M.E. and the arcade are number one on the Twin Galaxies scoreboard. George is a big collector of Atari 2600 games. George also holds some records on Galaxian and Donkey Kong Jr. You can always see George and subscribe on his YouTube Channel. When not gaming George makes his living as substitute teacher. Video game music adds flavor to a video game. It can also add a couple of notches to a video game. The music to Tony Hawk's Pro Skater series made the video game just as much as the graphics, and the gameplay. As far as the Golden Age games it was important too. Donkey Kong that came out in 1981 has a lot more music than most people realize, and it really does add to the experience. Even Space Invaders with that da da da noise is something that's an iconic memory. 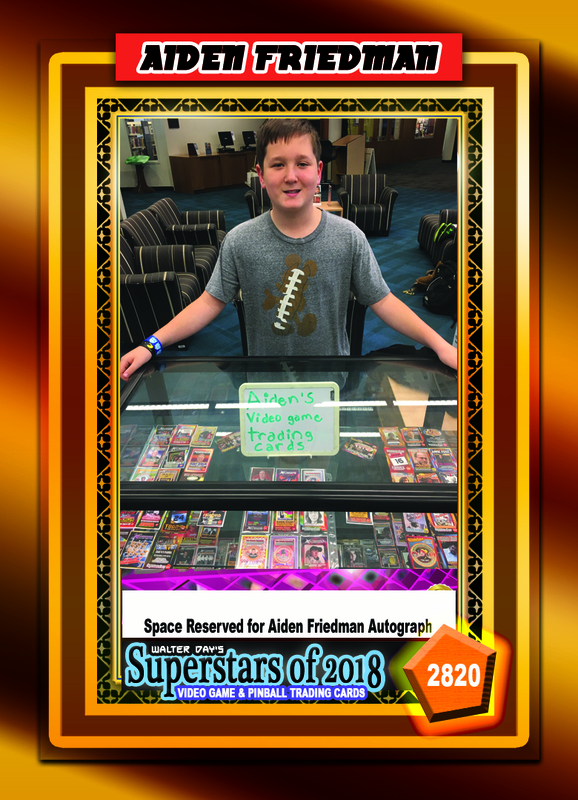 Our next Trading Card Spotlight features Aiden Friedman, who currently is displayed on card number 2820, from the Superstars of 2018 Collection. Aiden is an up and coming gamer who is heavily involved in the gaming community and contributes his time to be a junior editor and writer of Little Player Magazine. He also is a huge help to the Video Game Summit in Villa Park, IL, running raffles, helping setup and organize the convention. Aiden holds a few records on the Twin Galaxies scoreboard for Wii Sports Tennis and Wii Sports Resort Ping Pong. Aiden loves promoting gaming and doing everything he can to one day organize his very own Video Game Conference. 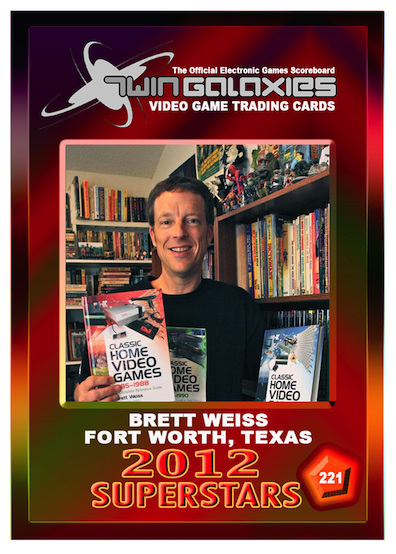 Yes, I am editor of Little Player Magazine, Co-Promotor of the Video Game Summit in Illinois and I am a collector of the Walter Day Trading cards. I also hold a few gaming records.